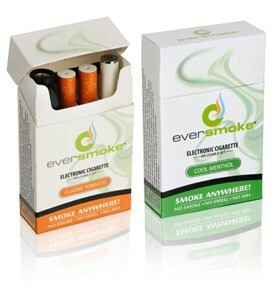 EverSmoke is known for their emphasis on quality and design which has made them a favorite of many vaping enthusiasts. VaporZone e-liquid is used in EverSmoke cartridges and is also one of the top brands for vaporizers in the market today. Their products are well packaged and come with a wide variety of flavors, nicotine strengths and accessories so you can customize your e-cig experience. 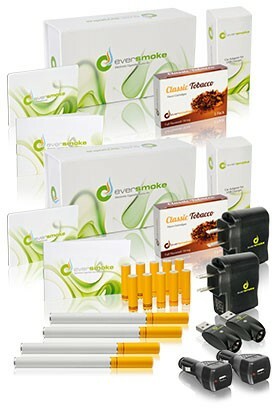 EverSmoke is a very good value e-cig because they work well. The flavor lasts until the end and you get thick vapor until the last few dozen puffs.The starter kits included cover a wide range of prices and offer excellent choices for those who are just starting out with EverSmoke or for those who have already been using the products previously. To learn all about EverSmoke, visit our full review here or for single use e-cigs, check out our EverSmoke Disposables review. 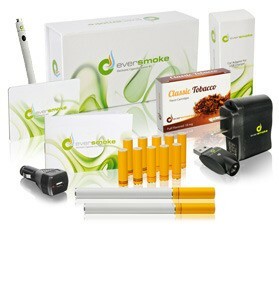 This basic starter kit makes for a solid introduction into the EverSmoke line, particularly in terms of price and accessories that it includes. For many, this is the way they began their journey into EverSmoke e-cigs. The main benefit is that the high quality of the product, but it does offer everything you need to get started with 2 batteries in the finish and color of your choice. The standard battery consistently produces 200 puffs or more while the high capacity one does an respectable and just as consistent 350+ puffs. Great kit to start vaping with EverSmoke. 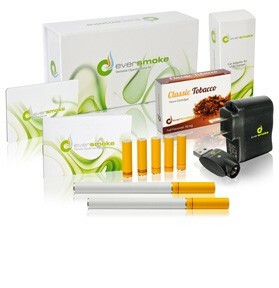 This is arguably EverSmoke’s most popular starter kit and one that provides great flexibility as well. The pro kits have more options than the standard kit, but it also is very convenient and easy to use as well. Featuring two high capacity EverySmoke batteries, you get longer usage and double the cartridges. A convenient USB powered wired e-cig for home or office use, as well as a car charger is included. This is the one for those who really want to get the most value for their money. This particular starter kits includes all the great accessories that really make the vaping experience enjoyable and quite practical for daily use. You get 2 high capacity batteries and one standard compact sized one. One of the high capacity batteries comes in manual, forcing your hand into trying both types. A portable charging case that doubles as a carrying case holds 5 cartridges and charges a standard battery on the go. The EverSmoke Ultimate Kit leaves you fully equipped with an additional 15 flavor cartridges, 1 USB Power Cig, all the chargers you need and a carrying case to transport it all. Here, for couples who enjoy vaping is a very economical package that basically includes two standard starter kits at a reduced price. In this manner, those that enjoy the EverSmoke experience can also save some money as well. At the promotional $99.99 price, this kit includes 2 of everything allowing you to share with anyone such as a friend or family member or even as a gift idea for a very small investment. 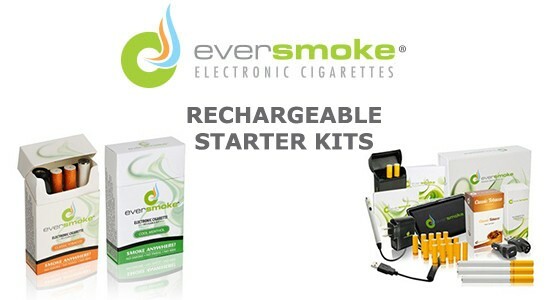 Another great way to experience EverSmoke for the first time as well this kit includes everything you need minus portable charging and carrying cases. Compact, stylish and efficient, this reusable express kit contains just enough to get you started and provides a real taste of what EverSmoke can deliver without costing much in the way of money. All things considered, this is arguably the best way to invest in a starter kit on a very tight budget. However, EverSmoke has proven to be a very reliable product and there should be no concern in investing a bit more if you can.